As the title suggests, I’ve decided that Fridays are going to become the day that I post my latest D.I.Y conquests. This is the very first D.I.Y I’ve attempted since year 12 art class (don’t ask). I love custom furniture. However, the price tag that comes along with these one off pieces you’ll find on sites like this, don’t really fit into our ‘supposed to be saving for a house’ budget. So I thought to myself it can’t be that difficult, can it? I’d also seen my friend in real life Stace do this on her blog here. So go grab yourself a cuppa as this is a long one. After consulting with my Mum, who had numerous D.I.Y projects on the go when I was little. She suggested that I start small and work my way up. I’m not much of a whizz with the sewing machine (unlike my amazing Grandmother) so I wanted to avoid sewing anything. 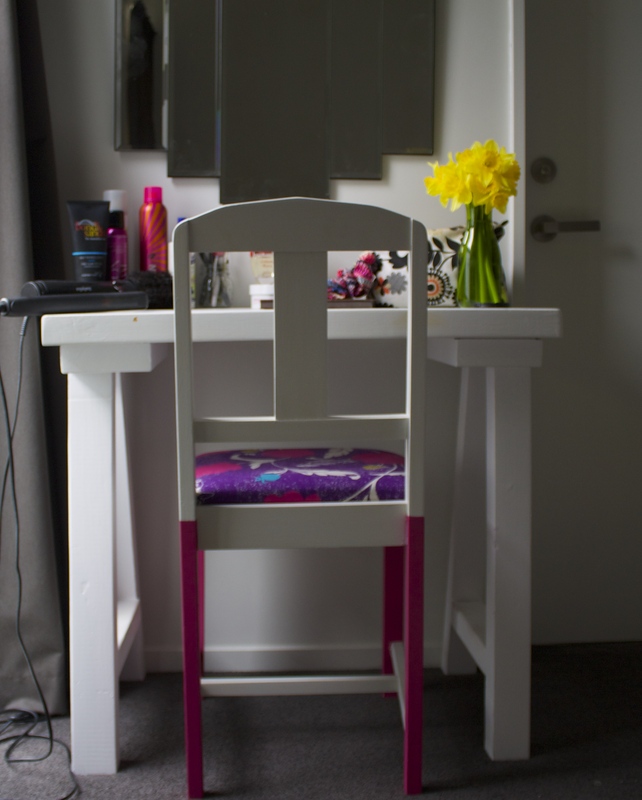 I trawled through Trade Me (NZ version of Ebay) for the right chair. I managed to win this one for a mere $10 NZD and it went to Nurse Maude Hospice, a charity shop and organisation very dear to my heart, so it felt like fate. I completed this project nearly a month ago and I hadn’t completely decided I was going to start a blog, which means I haven’t photographed the process very well (sorry). So with the photos that Chris; my other half took on my phone and some pictures I’ve managed to scrape together I’m going to try and explain how I achieved this. First things first, Mum you were right!. This was the easiest way to start my journey into D.I.Y and upholstery. Sadly, like I said earlier, silly old me didn’t take a picture of what the chair looked like before I ripped it apart. But trust me when I say it wasn’t pretty or that interesting. I knew that I wanted a bright fabric and that I wanted the top half of the chair to be white, to match the little table Chris had made me. I also knew that I wanted to incorporate a bright colour on the legs to add a little je ne sais quoi. I headed to my local Bolt Of Cloth. I could spend all day in that shop, the fabrics and other little bits and bobs they stock make me all tingly with D.I.Y excitement. Check them out here . I found this fabric pictured above in the $40 fabric bin and knew straight away it was perfect. It’s called Birdlife in Purple and Pink by a Japanese designer called Echino, I’ve managed to find the link here to the exact fabric. Next Step was to match the paint. That part was easy because we still had some leftover white paint from the desk Chris had made for me. 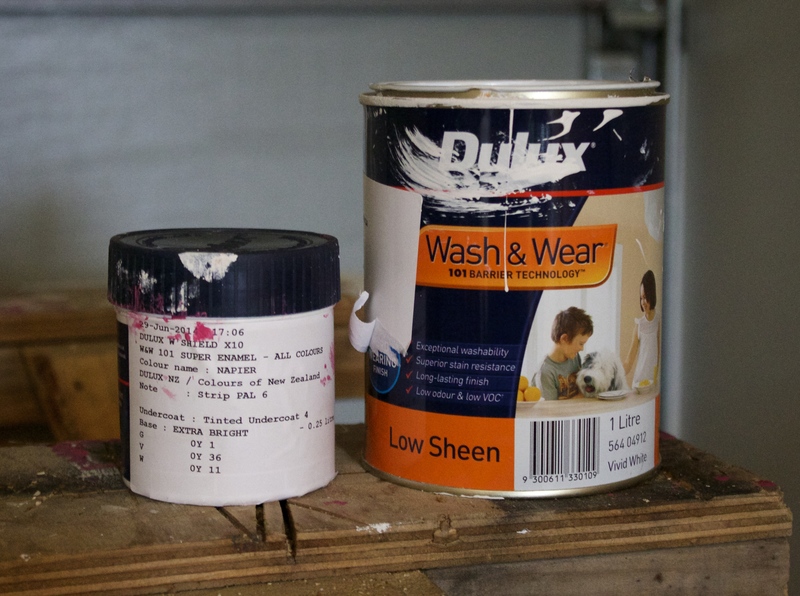 I’d recommend using a low sheen acrylic paint like this, especially if you’re going to add another brighter colour on top. The Legs were a little harder. I knew I wanted to go with a colour that was already within the fabric to tie everything together. Off to the local hardware shop we went and as if by magic, I took one look at the colour sample cards and there it was. The perfect match for the hot pink in the fabric. This Dulux paint in the shade Napier. The guy in the paint department recommended just getting a test pot size and that was more than enough. This item didn’t excite me that much, but boy did Chris get excited when he heard I required a staple gun for this project. We sussed out we needed a heavy duty gun in order to fasten the fabric to the wooden seat securely. This one was reasonably priced and did the trick. We also went for 10mm staples but maybe could’ve opted for something a little thicker as, a few of the staples did bend out of shape. We also purchased some more Sandpaper, which I haven’t bothered taking a picture of as we all know what that looks like. But I used a fine and medium sandpaper for this project. 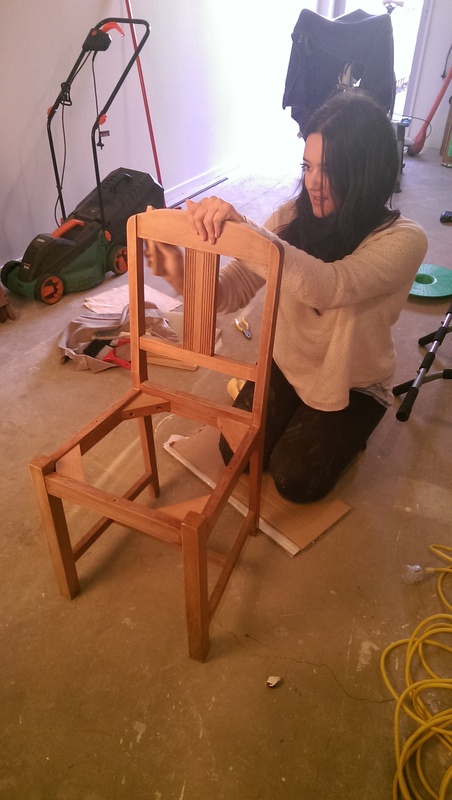 Me, Sanding the chair by hand. Please ignore our messy garage! On to the actual process and I’ll stop bleating on. I, unscrewed the seat from the chair by using a screw driver, which was really easy. Once that was off I then took a pair of pliers and a flat headed screw driver (is that what they’re even called?) and went about taking out the existing staples. I say I but Chris was a massive help with removing and attaching the fabric. 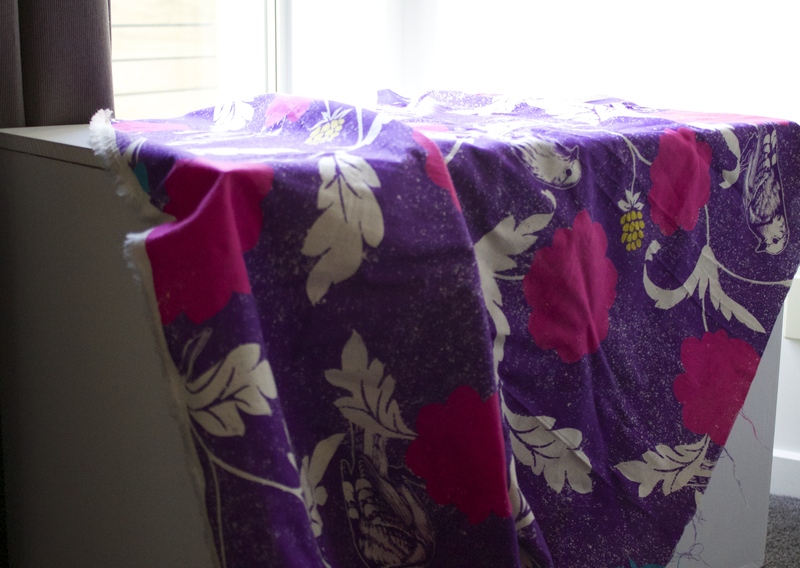 I then used the existing seat cover as a pattern for my fabric, as pictured below. This photo was taken after I’d finished, but you get the drift. Plus here’s a shot of the ugly green velvet. The foam that was under the old fabric was in great condition so there was no need to replace this. The next step was much easier than I anticipated (especially as I has an extra pair of hands) the easiest way to describe this without photos is that you basically approach it as if you were wrapping a present. We took it side by side. So, I held the fabric taught as Chris stapled. When we reached the front corners of the seat, this was a little more difficult and I’m kicking myself that I didn’t take pictures as an aid to show you. As the front two legs of the chair sit higher, the seat cover had indents where the seat would slot in around the legs. I’ll insert a picture below of what I’m talking about. 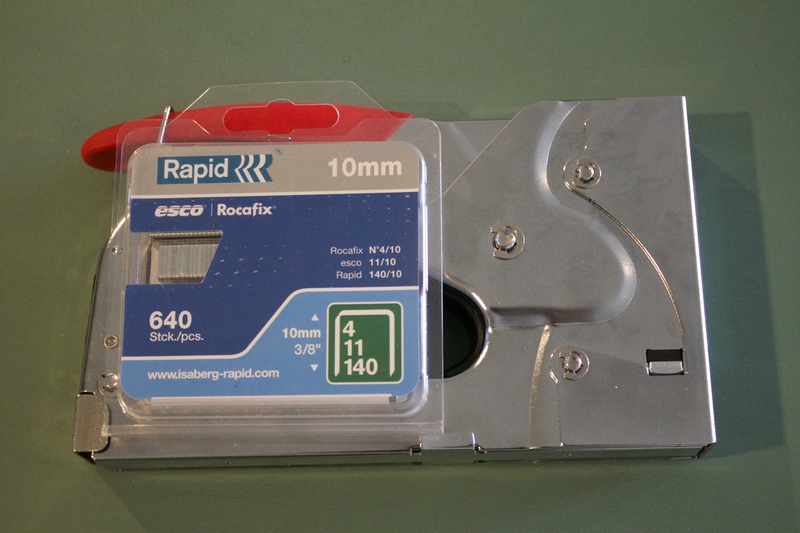 The way to approach this one is by folding and stapling and keeping it really tight. I really do recommend getting someone to help you with this as it can get a little tricky. 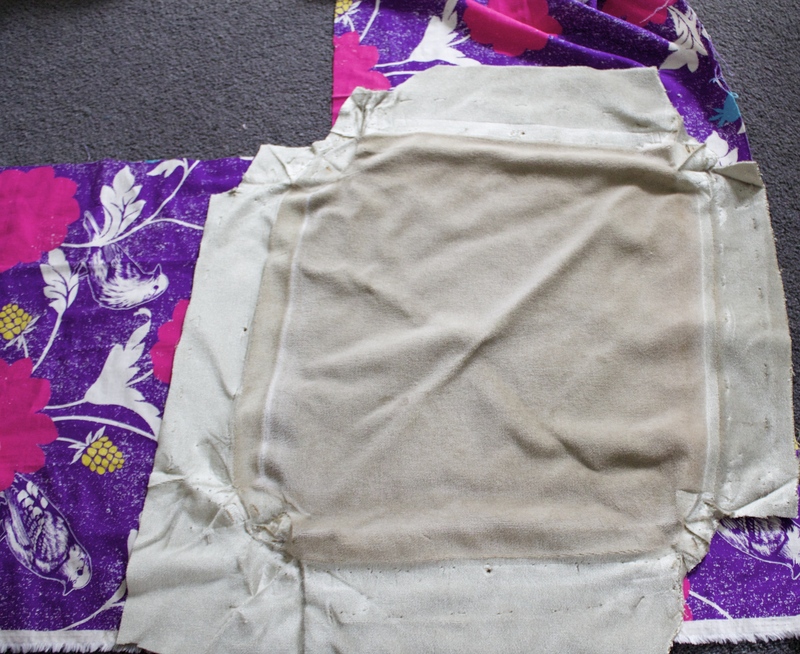 After that I the used the same piece of hessian type fabric that came with the chair (as pictured above) to cover the inside of the chair and make it look a little neater. This was really easy as, it was already a part of the original chair so, all I needed to do was reattach it. On to the sanding, my Favourite part…NOT. I hated this part as I’m a real instant gratification kinda gal and I just wanted to get painting. I even tried to convince Chris that we needed to invest in an electric sander. Anyhow I did it. I really only sanded it back to get the top layer of varnish off. If you are going to sand by hand, I would recommend investing in an electric sander… no just kidding, I’d recommend getting one of those sanding blocks just to save your poor little hands. I used the medium paper first and then went over it with the finer one to make the base more even for the paint to be applied. My Granddad is a Painter by trade and therefore my mother, his daughter didn’t really let us touch paint when I was younger. This means that whenever I can get my hands on paint, I get super excited. This part is pretty self explanatory. Only little piece of advice I would have would be light layers and build on them, to avoid the dreaded drip of paint mark. I ended up only applying two coats of the white base. I made sure to sand lightly with a fine sandpaper in between coats. The next part was even more fun. I couldn’t wait to get the pink on. This again is pretty self explanatory. The only little hiccup I had here was that, Sebastian likes to follow me around and see what I’m doing, ALL THE TIME. You know the whole ‘curiosity killed the cat’ saying. Well in this case it should be ‘curiosity painted the cat pink’. Sebastian decided when I wasn’t looking to make his way into the garage and jump up on the wooden horses the chair was on and rub up against it. Which then resulted in me chucking him into the sink and dousing him in lukewarm water. He certainly learnt his lesson, especially as he had to rock pink tinged whiskers around the neighbourhood. Thankfully both the chair and Sebastian managed to survive this ordeal. Back to the chair, I was going back and forth between whether or not to take the pink right up the back of the rear legs. 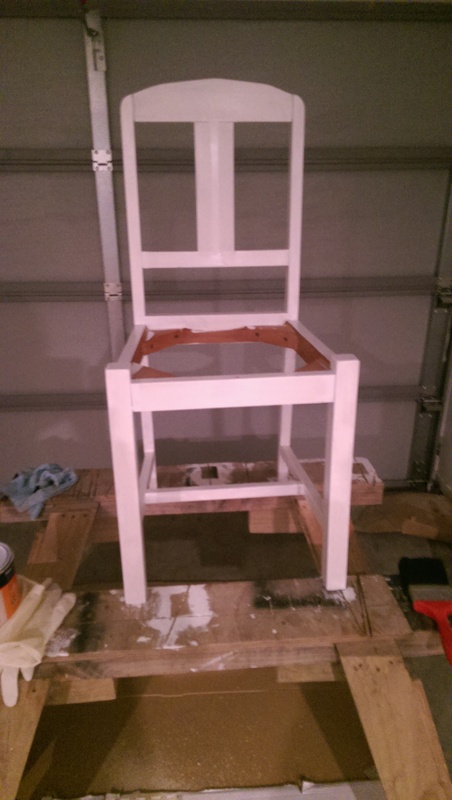 However, I wanted to keep the majority of the chair white and in hindsight I’m happy I did leave it. 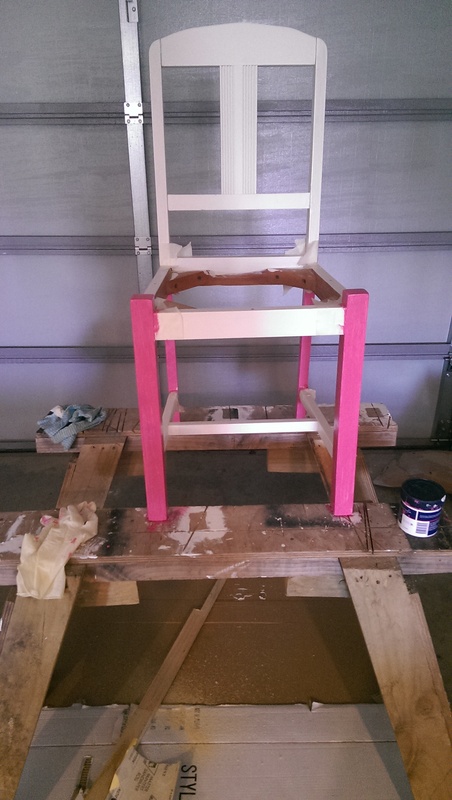 The pink paint did need two coats again as it was quite sheer. Again I sanded (Joy) between coats of paint. Once they were dry it was time to pop everything back together which was super easy. In terms of drying time, it was really quick each layer probably only took an hour max to dry. I decided to to put a top coat on the chair and keep it matte as I just prefer that look personally. So, here it is the final product. I’m pretty pleased with how it turned out. 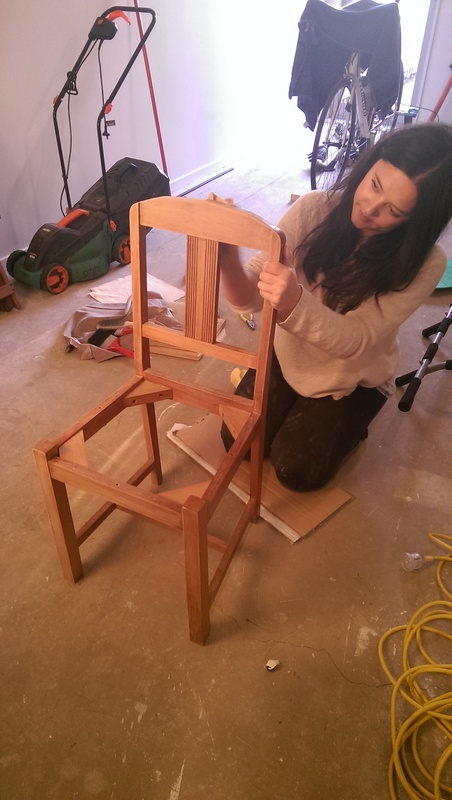 It’s definitely given me a taste of D.I.Y and I’ve already purchased my next chair, so watch this space. I’m also thinking I’ll either attempt to make a lampshade with the left over fabric or some cushions if I can brave the sewing machine. I hope this was helpful, I know it was probably a little long, but hey that’s my style. Let me know what you think and any suggestions or ideas or projects you’ve got on the go now! 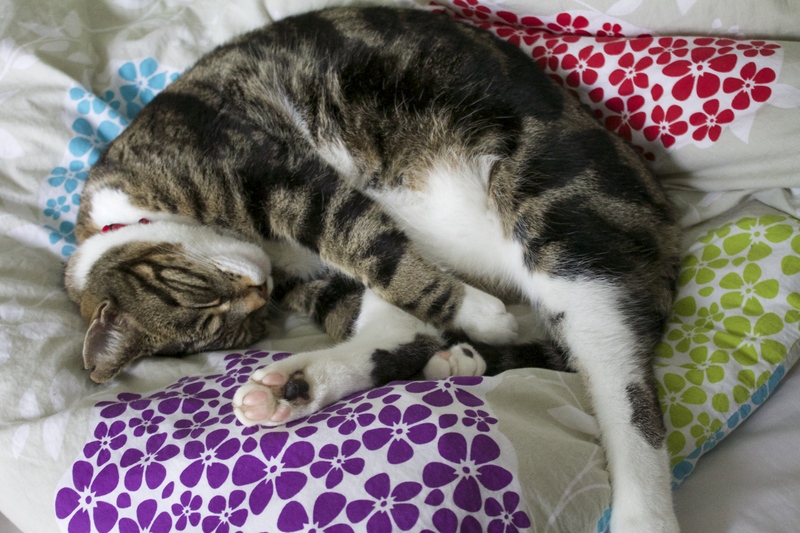 Oh to be a Cat, That’s A Life That’s Good!